In the Kafkaesque charade that constitutes the UK’s implementation of Brexit it’s probably time to look at things from the viewpoint of the EU, and more specifically their apparatchiks the EC. Brexit to them is an absolute disaster. It removes the world’s fifth-largest economy from the single market. It reduces their income. It removes by far their best link to the world’s only superpower. It removes the most powerful armed forces in Europe (low baseline). It removes the best universities in Europe. It removes the world’s financial centre. Possibly worst for the apparatchiks (a Soviet term which is utterly appropriate – man up and face reality, Tusk), it destroys the myth that the EU is necessary for the wealth and happiness of Europeans. The apparatchiks are well used to disaster. Solution one is to demand a second vote – or a third for the Irish. That may yet come off for them if the BBC has its way. Solution two is to kick the can down the road and delay – perhaps by inventing a transition period and then extending it indefinitely. Incredibly, they have persuaded Mrs May to suggest this for them. The third trick is to fabricate an intractable problem, in this case the Irish border, and we all remember that any Irish question gets so complicated that by the time a solution is found everyone has forgotten the question. And while they try to sort it out the UK remains in the EU, buying camembert, driving BMWs and paying its membership fees. So our genius government, elected on a commitment to deliver Brexit, has actually set itself on a course to deliver limbo. It’s not been easy for them to be so consistently idiotic and unworldly but Mrs May has managed it. She now faces a simple choice. She could say, ‘Look, I’ve gone way beyond my mandate and the EC isn’t playing. So we’re off with no deal, which as I’ve said before is better than a bad deal and accords with the decision of the electorate.’ If Mrs May won’t say that then the Conservatives urgently need to find someone who will. At which point the EU is hoist by its own petard and the UK line is ‘You want to make Airbus without wings – good luck. You want us to tell you what we know about terrorists – come back, on your knees. You want to sell us your Renaults, Mercedes, Seats, Skodas and Alfa Romeos – not a chance. £30billion cash – in your dreams. Get your fishing boats out of our waters. Of course if you want a trade deal, fine. Here are our terms.’ As we all know, that’s what Vlad would do. Of course (and I really hope I’m wrong) Mrs May will do no such thing and there is no one in the Conservative Party who will take the job – most don’t have the ability and the few who do (struggling to think of one) don’t need the hassle. So the DUP will detonate and the government will fall. A few weeks later we’ll have an election and after all the usual drivel we’ll all find ourselves in a booth on our lonesome wondering where to put the magic X. Conservative? Fat chance. Labour? Not me (although the snowflakes and the usual useful idiots will go for that). UKIP? Sorry, but no. It was a fab movement, but it has no chance of becoming a sensible party. Lib Dem? Are they still alive? There remains one alternative. 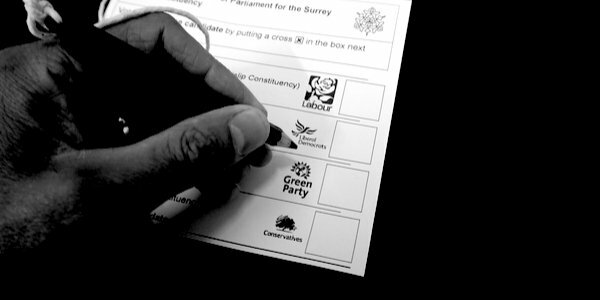 Spoil the ballot paper and write in clear capitals at the bottom NONE OF THE ABOVE. If, as I suspect is likely, the NONE OF THE ABOVE win, join me in Downing Street to welcome the next person who has the temerity to think that they represent me.